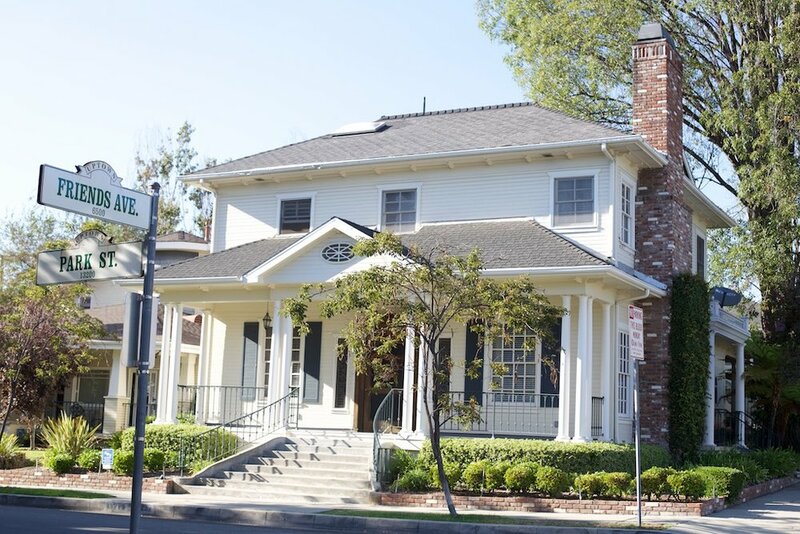 13227 Park Street underwent changes after the 1987 Whittier earthquake and has evolved into one of the several twentieth century expressions of the Colonial Revival style. Colonial is the most persistent of all American residential architectural styles. This particular example, a very substantial two story house, is defined as Colonial Revival by its nearly symmetrical facade, multi-light windows and a one story full-width porch supported by groups of classical columns. Interesting exterior features are the use of small corbels beneath the eaves, and, of course, the front entry door and its surround, not original to the house, but old and very impressive. The original house built in 1910 was a single-story structure, but the Emerson family (of White-Emerson Mortuary on Philadelphia Street) added a second floor shortly after they purchased the home. The current owners moved in just weeks before the 1987 Earthquake rocked Whittier, damaging the house almost beyond repair and requiring extensive work inside and out. Fortunately the family was able to live in the apartment above the garage during the construction. Although the exterior appears very different today than it did before the earthquake, the home maintains the historic character of its 1910 origins. It is a beautiful home with an inviting backyard featuring serene foliage, antique brick and a large coy pond, creating a relaxing, spa-like setting that will make you feel like you've been transported to a 5-Star resort. The collection of antique architecture and furniture is noteworthy, including antique doors throughout, an impressive archway between the front room and family room, a stunning fireplace mantle, and lovely stained glass and etched glass windows. The spectacular door in the dining room is over 130 years old! Fun Fact: In the movie Hocus Pocus, the living room was used for the Devil scene featuring Penny Marshall. She came down the stairs to yell at her husband, much to the dismay of Bette Midler, Sarah Jessica Parker and Kathy Najimy. The white house across the street (6536 Friends) was used for the Trick-or-Treat scene.